One of the most important reasons to retain records is compliance. The DEA requires that prescription records must be kept for a minimum of two years, with different filing requirements for Schedule I and II than for schedules III through V. Various state Boards of Pharmacy may impose additional requirements for recordkeeping and accessibility. There are further requirements for document management under HIPAA and CFR Part 11. However, you are not generally required to maintain physical copies of the media you are retaining, provided it’s readily available for inspection upon demand. Backups are a best practice with any kind of recordkeeping, but they’re especially important in pharmacy. Of course, if you’re keeping paper copies, that means more copies, which in turn means duplication expenses, and considerable added expense for secure off-site storage. When records are kept electronically, creating and keeping duplicates is much easier (not to mention cheaper). Storage is likewise easier, since “off-site” can be as simple as cloud-based backup. Of course, compliance isn’t the only reason for good document management. Your patients also benefit. Electronic record storage gives you more transparency, with snapshots of each prescription filled and dispensed. That, in turn, gives you enhanced visibility of potential drug interactions, prescription adherence, and alerts for potential misuse or abuse. If you’re using automation as part of your pharmacy workflow, incorporating electronic document management is a natural complement. It offers improved accessibility due to quicker tracking, better organization, and higher visibility among key personnel. The added efficiency cuts costs over and above the other cost savings leveraged by implementing a document management solution. At this point, you may well be wondering why a company that specializes in pharmacy fixtures is spending this much time talking about records retention. The reason is simple: your money and your space is limited. Paper record storage is expensive, especially if you’re diligent enough to have redundancies at different steps in the process. But over the years, we’ve also noticed that it’s also very wasteful of your limited space. The fact is, we’re more than pharmacy shelving; we offer pharmacy solutions. Those solutions work best when they take a holistic approach to your pharmacy workflow. 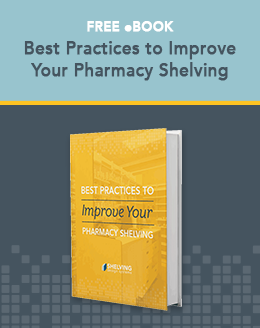 More efficient document management — especially when you transition from paper to electronic record keeping — helps you do more with your pharmacy design, since you’re freeing up space you might not otherwise have had. For help with this and a host of other design challenges, we invite you to contact Shelving Design Systems.